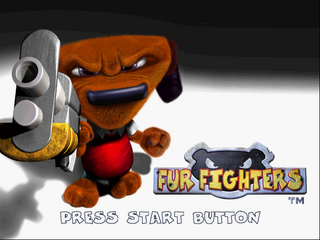 Fur Fighters is a video game developed by Bizarre Creations and published by Acclaim Entertainment for the Sega Dreamcast in 2000. It is a third-person shoot-'em-up game involving animals with weapons. During development the game was known as Furballs, and prior to this, Drive-By. Fur Fighters sees the player control one of six animals, each with their own special abilities, saving members of their family who have been kidnapped by the evil General Viggo. It is a third-person shooter involving large, expansive areas with both action and puzzle elements. Levels see the characters rescue younger members of their large families, though bosses bosses involve brainwashed mothers, husbands and wives. Born in Glasgow, Scotland, Roofus is the natural born leader of the Fur Fighters. He is also the only member who can dig holes in the ground. After defeating Viggo years ago he gave it all up to settle down with his wife, Winnie and their children, until Viggo returned and kidnapped them. Roofus decided to battle for one last time to save them and get rid of Viggo once and for all. Born in Hong Kong, China, Chang is the smallest of the Fur Fighters and therefore is the only member who can get into small places. Chang is probably the most useful of the group as he has a scientific mind, is quick witted and is brilliant with weapons. His mission is to save his wife, Mai and children. He is a small red Firefox panda. Born in Paris, France, Juliette is the only Fur Fighter who can climb up and down walls; she is also the only female in the group. Juliette is very athletic and can be very short-tempered and stubborn. She prefers to fight alone, but if persuaded she will stay with the group. Her mission is to save her husband, Claude and children. Born in Alice Springs, Australia, Bungalow is the only Fur Fighter who can jump high and far. Best friend of Roofus, Bungalow is rather slow and dim-witted; he does not realise his own strength or ability. He seems to be very happy to take orders from the other members. His mission is to save his wife, Esmerelda, and children. Born in Argentina, Rico is the only member of the Fur Fighters who can swim underwater. Rico is not the most serious or fully-focused member as he seems to think himself as a hero. He is also overconfident about his fighting skills and is a total daydreamer. His mission is to save his wife, Juanita, and children. Born in Fur Fighter Village (presumably, as he is only a day old), Tweek is the youngest member of the Fur Fighters. He is also the only member who can glide. Tweek was born bigger and a different color than the rest of his siblings. His family was taken by Viggo, and Tweek was taken in by the other members who taught him how to use weapons, allowing him to help in the war against Viggo. His mission is to save his mother, Gwyneth, and his brothers and sisters. He is responsible for kidnapping the Fur Fighters' families and trying to take over the world. Viggo is pure evil, yet well spoken. He leads his army of stupid bears against the Fur Fighters and he is also surprisingly strong. Bristol is a ghost that helps guide and advise the Fur Fighters during their mission against Viggo. Sternhouser is the personal fitness trainer of the Fur Fighters who loves dancing and gives them better weapons. Before the idea of saving their families was conceived, Fur Fighters saw the six playable animals shooting bears for erecting a shopping centre in the forest. Main article: Fur Fighters/Magazine articles.